Interior furnishing: Top20 - Pula double curtain rod with stainless steel rings. Curtain rod Top20 - Pula, double-rail, with stainless steel rings. 2-rail curtain rod made of stainless steel V2A, with stainless steel tube Ø 20 mm, bracket system Top 20, end knob Pula, stainless steel rings for curtain deckoration. Stainless steel bracket system and mounting system Top 20, double-rail. Mounting system Top 20, double-rail. * Complete sets 400-600cm – price on request. * The length of rod without finials is valid as ordered length. From the length over 260cm, the tube is divided in the middle. Connection adapter is also supplied. Interior furnishing, curtain rod Top20 - Pula, double-rail, with stainless steel rings. Except straight curtain rods, we also offer all of our style-sets in any other form, bent completely according to your needs and situation room and prepared to. Whether square bay windows, round windows, curved walls and ceilings, roof windows and roof slopes, excluding window and door frames - for all this, we offer tailor-made curved curtain rods on. Just send your sketch or drawing by Email, Fax: ++49 9104/8228399 or Post us, you will immediately receive an offer. Of course, all the needed support, wall brackets, ceiling suspensions, and mounting materials are everywhere. Do they have any further questions? contact us! Rod bracket Wandlager 20, V2A-stainless steel. Extension for bracket Top and Primo, V2A-stainless steel. Joint 20mm made of V2A stainless steel. Rod bracket Top 20, V2A-stainless steel. End knob Zylinder 20, V2A-stainless steel. 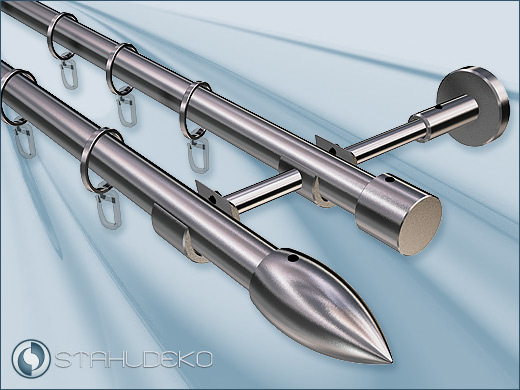 Stainless steel curtain rod Top20 - Pula, double-rail.